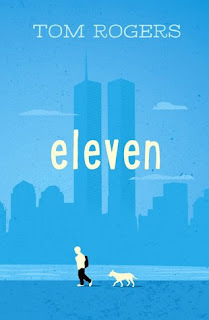 Eleven is one of those books that is a quick read because it holds your attention from the very beginning. Alex Douglas is almost eleven and he knows what he wants for his birthday. After all he has two things he loves. Planes and dogs. He isn’t old enough to fly a plane yet, but his parents have talked to him about being more responsible before they will get him a dog. That is the only thing he wants. The night before his birthday he really blows things. He has argued with his mom and then he tells his dad he hates him. Could things get any worse? When he wakes up the next morning on September 11th he has no idea how bad things can get. He is sure he won’t be getting a dog for his present. On the bus he becomes the target of the school bully. Shortly after school starts he is sent to pick up his sister from school and told to go to his mother’s work. No one will tell him anything. He is told to go home and not to watch the TV. Alex had seen a stray dog on his way to school and then he sees him on his way home with his sister Nunu. He is sure this is meant to be his dog. Then he learns the terrible truth about event of the day. His father drives a PATH train that stops under the Twin Towers. His last words to his dad was “I hate you.” He starts making deals. If he takes the dog back to his rightful owner, then his dad will come home safe. The strange thing is, he meets a man who lives next door to where the dog used to live. He too has been making deals in hopes his son will come home. I made it all the way to the end before I started crying. Mac, the old man and Alex for a bond that was not expected. They have a connection through the love of planes. This is a book that keeps you reading to see who will and who won’t survive. I couldn’t put the book down. The events were well researched and not too heavy for middle school students. I am proud to put this book on my shelves for my students.